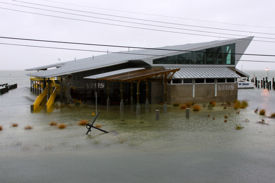 An Executive Order from Virginia Governor Ralph Northam calls on the Virginia Institute of Marine Science to leverage its long-term monitoring programs and expertise in flood forecasting to further increase the Commonwealth’s resilience to sea-level rise and natural hazards. Executive Order Twenty Four—signed by the Governor during last week’s 6th Annual Conference of the Virginia Coastal Policy Center at William & Mary Law School—calls for a sweeping series of actions to limit the impact of flooding and extreme weather events within the Commonwealth. Dr. Carl Hershner, Director of the Center for Coastal Resources Management at VIMS, says “I was particularly encouraged that the Order calls for actions that use natural and nature-based solutions whenever and wherever possible.” CCRM was at the forefront of a multi-decade effort that ultimately led Virginia’s General Assembly to enshrine one such solution—“living shorelines”—as the preferred technique for stabilizing the Commonwealth’s tidal shorelines. The Order—on a fast track that requires most of its directives to be completed within 180 days—calls on guidance from VIMS in four separate areas. Leading the statewide effort is the Commonwealth’s newly designated “Chief Resilience Officer,” Secretary of Natural Resources Matt Strickler, a 2007 graduate of VIMS and the Thomas Jefferson Program in Public Policy at W&M. As evidence of the pervasive threat that sea-level rise poses to Virginia and the nation, the Executive Order directs Strickler to consult not only with VIMS and the Commonwealth Center for Recurrent Flooding Resiliency, but with offices throughout state government—including the Secretaries of Administration, Commerce and Trade, Finance, and Transportation. The consultation also extends to local government; federal partners such as the Departments of Defense, Transportation, Agriculture, Interior, and Housing and Urban Development; and non-governmental groups including civic organizations, businesses, and non-profits. The Executive Order’s first VIMS-related directive is for agreement on a unified projection of sea-level rise for use in the design, siting, and construction of state-owned buildings beginning on or after January 1, 2020. Dr. Mark Luckenbach, Associate Dean of Research and Advisory Services at VIMS, says “This will ensure that all new state-financed construction follows a consistent, science-based sea-level standard that minimizes its vulnerability to coastal flooding.” VIMS is well positioned to assist in this directive, having already created “Sea Level Report Cards” that forecast water levels for Norfolk and 31 other coastal localities to the year 2050; an interactive data graph that compares VIMS’ 2050 sea-level projection for Norfolk with forecasts provided by NOAA and the Army Corps of Engineers; and the first major study of recurrent coastal flooding in Tidewater Virginia. A second directive is to establish a “freeboard” standard for state-owned buildings, again with an implementation date for projects slated to begin in 2020 or later. Freeboard is the height of a building’s lowest floor above a given flood level. 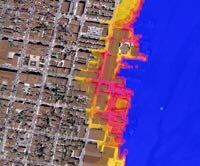 VIMS, with access to highly accurate, LIDAR-based elevation maps and operation of its own Tidewatch network and high-resolution flood models, is uniquely positioned to help determine the most effective freeboard standard for coastal Virginia localities. A third directive—closely related to the first two—is to work collaboratively with local governments to ensure that the statewide sea-level projection and freeboard standards are useful for local decision-making. VIMS is again ahead of the curve here, with its Comprehensive Coastal Resource Management Portals, which provide guidance on shoreline management tailored to each of the 45 cities and counties that make up Tidewater Virginia. The institute also brings decades of advisory service experience with these cities and counties, as well as with regional planning district commissions, wetlands boards, and other local stakeholders. The capstone of Governor Northam’s Executive Order is a “Virginia Coastal Resilience Master Plan,” which will identify the most effective tools, techniques, and programs for reducing the impacts of tidal and storm-surge flooding. 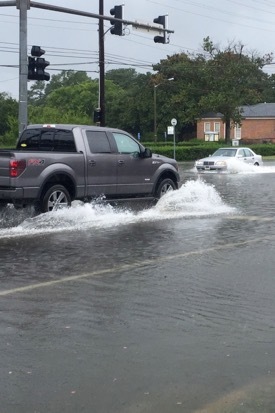 This comprehensive plan, with input from VIMS and scores of other partners, will first identify all ongoing, planned, and proposed federal, state, and local projects to reduce flooding and flood risk; then “provide recommendations for additional hazard-mitigation, flood-control, and adaptation projects to fill in gaps and improve the preparedness and resilience of the entire coastal area of Virginia for flooding and sea-level rise.” The AdaptVA website, a collaboration between VIMS and the Virginia Coastal Policy Center, provides a step forward on both goals.